There was a time that if someone described something as 'Mauve' I was instantly turned off it. It just wasn't my shade & I knew it. BOY was I missing out! It turns out that mauve is a great shade that suites basically everyone (particularly pale people like me). Who knew? Okay, I bet a lot of people knew but I didn't. 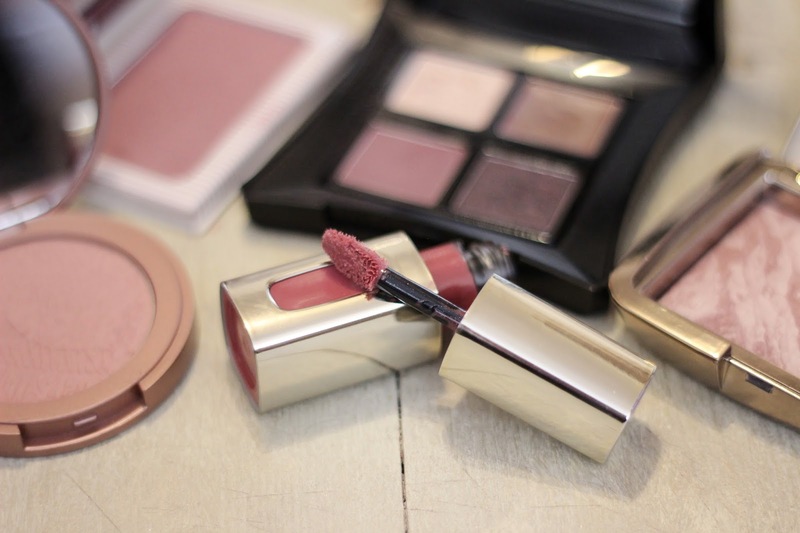 These are the products that opened my eyes to the awesome-ness of mauve. Starting with the product that started it - the Balm Instain' Blusher in Pinstripe. I actually got this because I thought it was going to be a great plum toned blusher for Autumn/Winter. It is called plum, it actually is kind of plum but looking at it again it's more like a deep mauve.....with a slight golden iridescence that is just visible on the skin. This is a great blusher formula so even if you don't pick this exact shade, it is definitely one that is worth trying . P.S. there is a more 'traditional' mauve shade in this range as well, if you think that this one doesn't count. A product that I want to mention quickly (just edging it in awkwardly) is the Complement Palette from Illamasqua. Mauve is not a particularly common eyeshadow shade but for me it feels like the shade forgiveness is a mauve-y colour. It definitely is in my palette. This is that palette that gives me a mauve feeling so it's included. Deal with it. The next is maybe my favourite mauve product....it's definitely the most expensive. And the most luxurious. The Hourglass ambient lighting blushes have had a lot of hype, almost as much hype as the original powders. They've really earned the hype though; these powders have the most amazing consistency. Actually I only have one of these so the rest of them could be awful, but let me tell you Mood Exposure is STUNNING. A highlighter-blush combo that in no way emphasises pores (unlike most highlight-y blushers). I wouldn't actually call this a highlighter blush, I would call this an illuminating blush. I defy anyone to look ill &/or tired wearing this blusher, I'm serious. It is amazing & the colour of this one is also the best mauve-y/natural shade. The Tarte Amazonian Clay 12-Hour Blusher in Exposed is my last mauve blusher. Vintage or tacky once explained the last blush as having the mauve-y edge that this blush almost had, but not quite. So, from that you can probably tell that the blusher is sat on the neutral side of mauve. It really is like a blusher that's not a blusher.....just a touch of really lovely natural colour. Lastly, the lip colour that was a revelation. I did a full review of this so I'll keep it brief but, when I got the L'Oreal Liquid Lipstick in Molto Mauve I was totally shocked that I even liked it - mauve is totally not my colour. But then I realised I'd been wearing a lot of mauves. That actually all of my go-to blushers were mauve. It totally freaked me out. Anyway, as the cheapest of all the products I've mentioned this might be a good one to start out with if you are wanting to try mauves out for the first time. these are my fabourite make up tones! i'm dying to try a few products from the tarte amazonian collection, sooo perfect! !